Chandigarh, June 9:- The four day curtain raiser event of the Chandigarh Administration in the wake of 2nd International day of Yoga scheduled to be held on 21st June, 2016 inaugurated here today at Parade Ground, Sector 17, Chandigarh with the public address on “Yoga-The True Dimension” by Sri Sri Ravi Shankar ji, founder, Art of Living. Prof. Kaptan Singh Solanki, Governor, Punjab, Haryana & Administrator, UT, Chandigarh was the chief Guest during the occasion. Mrs. Kirron Kher, Member Parliament, Chandigarh, Sh. Parimal Rai, IAS, Adviser to the Administrator, Chandigarh, Sh. Anurag Aggarwal, IAS, Home Secretary, Sh. Ajit Balaji Joshi, IAS, Deputy Commissioner, Smt. Kriti Garg, IAS, SDM, Sh. Amit Talwar, ADC, other senior officials of the Chandigarh Administration were and thousands of city residents & devotees of Sri Sri ji were present during the programme. 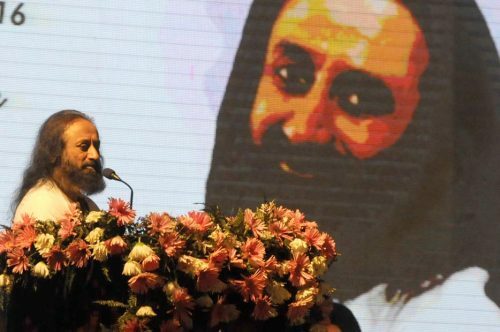 During his address Sri Sri ji said that one aspect of the Yoga way is to provide us techniques to lead a stress-free life. On the other hand, Yoga is also the greatest wealth of humankind. He said that Yoga is like a vast ocean. You can just go for a breeze, or you can go with an oil rig and drill for oil … Yoga offers many things to different people at many different levels–whatever they aspire for: union with the cosmic consciousness, or physical health, mental clarity, emotional stability and spiritual ecstasy — all this is part of yoga. He said that India is the land where yoga was born and we must finally take the responsibility to spread it everywhere, starting from classrooms. This will help young people to move away from gun culture and violence. He said that Yoga is a lifestyle and should not be mistaken for only asanas. A disease-free body, quiver-free breath, stress-free mind, inhibition-free intellect, obsession-free memory, ego that includes all, and soul which is free from sorrow are the signs of a perfect yogi. As Krishna said in the Bhagvad Gita, “Samatvam Yoga Ucyate” – equanimity in the individual is a sign of yoga. Sri Sri said when Art of Living programs started in the early 80s, yoga was seen as being practiced by freaks and Himalayan yogis standing upside down or on one leg. That is one of the reasons why we called our program, the Art of Living, a generic term that people could relate to across races, religions and cultures, he added. While addressing the gathering, Prof. Kaptan Singh Solanki, Governor, Punjab, Haryana & Administrator, UT, Chandigarh said that I congratulate all the citizens of Chandigarh that they got the opportunity this time to host the 2nd International day of Yoga. He said that it is very difficult for any philosophy, religion or culture to survive without state patronage. Yoga has existed so far almost like an orphan. Now, official recognition by the UN would further spread the benefit of yoga to the entire world. He said that the Chandigarh Administration has done appreciable job by putting its all efforts to ensure public participation during the 2nd International day of Yoga scheduled to be held on 21st June in Chandigarh. The three day academic conclave on “Yoga for Good life” will be started in CII, Sector 31 on 10th June, 2016 (Friday) from 10 am to 5 pm and Bharatnatyam by Dr. Suchitra Mitra, famous classical dancer and Moonlight Yoga at parade Ground, Sector 17, Chandigarh at 7 pm onwards.